The raccoon is a small primarily nocturnal mammal with adults measuring twenty to thirty inches in length. 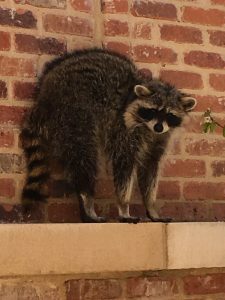 They can weigh up to thirty-five pounds, though in urban areas where they thrive on our refuse raccoons can weigh up to 60 pounds. Their fur is grayish brown with a bushy banded tail and black masked face. Raccoons appear to flourish in places where humans have developed the land. Two of the raccoon’s most distinctive features are its extremely dexterous front paws and its facial mask. Raccoons are noted for their int elligence, with studies showing that they are able to remember the solution to tasks for up to three years. They are highly adaptable, extremely intelligent animals that live well in cities, suburbs, and rural environments. Their preferred habitat consists of brushy or wooded areas near streams, lakes, or swamps. Rabies – is an acute, fatal encephalomyelitis caused by neurotropic viruses. It is almost always transmitted by an animal bite that inoculates the virus into wounds. Any raccoon bite or scratch should receive prompt local treatment by thorough cleansing of the wound with copious amounts of soap and water; this local treatment will significantly reduce the risk of rabies. Anyone who may have been exposed to rabies should be advised to always contact local health authorities immediately for advice about post exposure prophylaxis and should also contact their personal physician as soon as possible. Roundworm – Baylisascaris procyonis is the name of the species found commonly in raccoons. Infected raccoons commonly shed millions of eggs in their feces Anyone who is exposed to environments where raccoons live is potentially at risk. Hunters, trappers, taxidermists, and wildlife specialists may also be at increased risk if they handle raccoons or raccoon feces. Raccoons cause damage or nuisance problems when they seek to gain entrance to attics or chimneys or when they raid garbage cans in search of food. Raccoons matte down insulation, keeping it from working properly. Occasionally, they will gain access into chimneys, attics, basements, crawl space beneath houses, under patios and decks, and out buildings. Your lawn, garden, or field crop can be ruined by these mischievous animals. There can be odors, risk of disease, and damage to interior ceilings. They have learned that garbage cans and dumpsters are excellent sources of food, and that houses are excellent habitat. Raccoons are also very adept at gaining access to weak or open areas of a poultry pen. Raccoons should not be handled by inexperienced individuals because of the risk of rabies infection. A special license is needed to remove raccoons that are causing damage. Raccoons may be relocated. We cannot stress the importance of contacting a professional as raccoons can become aggressive when cornered or threatened. Once they are living in a structure, raccoons should be removed and the structure sealed up. 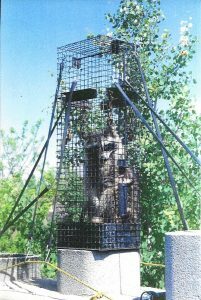 A qualified ADC wildlife professional will find the entry point that the raccoon is using to enter the structure. We then remove the offending animals with cage traps. When we are confident the problem raccoon(s) have been removed, the entry point holes need to be patched. This is a very important step to prevent re-infestation.